An hour ago I was all set to go out with ye for another whimsical meander through the west in winter, and I had a story in my head about the whereabouts of the best bottle of poitin in Connacht this fall and a recollection of Charlie Chaplin himself once pulling a pint of porter for me on a Good Friday in Kerry. But that is all gone now because of something I heard 20 minutes ago which made me both sad and mad. I’m sorry about that, but I have to get this off my chest. A couple of months ago I ranted and railed here about the manner in which the fallen Bishop Eamon Casey of Galway was still being treated by his former brother bishops in the Irish hierarchy decades after his sensational fall from grace and power through having fathered a son with Annie Murphy. The world media feasted on that story for a long time as Eamon Casey went down to South America as a missionary to begin serving the penance imposed on him after his resignation in 1992. My main anger and regret, as expressed here was that, 40 years after the birth of his son, and his disgrace, the rapidly deteriorating old priest, by then in a nursing home, was still not allowed by his beloved church to celebrate his Mass in public or even in the semi-public confines of a nursing home. One would have liked to believe that he had fully served out even the most severe penance in the decades since his fall, and that a church which prides itself on forgiving sins would have extended at least that element of forgiveness at last. What makes me even angrier today is that the church Casey served so flamboyantly and so well since his ordination in the 1950s has left it too late to forgive and forget. 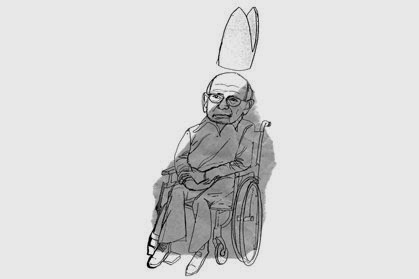 I heard reliably that the old bishop, now in his eighties and in rapidly failing health, would no longer be able to celebrate even a semi-public Mass because, God love him better than his peers, he is now wheelchair bound. That is very sad indeed. A measure of the continuing interest in his story is the fact that the Late Late Show on RTE, which still has national clout, recently brought in his son Peter as a major guest. Born in Dublin in 1974, burly and articulate, and bearing a distinct resemblance to his father, the age of the American-based Peter, now almost 40 years old, testified to how long ago it has been since the old bishop fell from grace, and how terribly long has been his penance. Peter said he would visit him before he returned to the U.S., and I assume that he did. The interview was good television at one level but, at another, extremely painful to view for those many of us here in the west who feel so sorry for a man who was once the most popular and populist bishop in Ireland and indeed in England too. With the track record in social and pastoral work to prove it. Any time Casey’s story is mentioned today in normal conversation among ordinary people, one point is always quickly and strongly made. It is that no little boy or girl was involved in the bishop’s scandal; that his sin of the flesh was committed with a consenting adult woman. The appalling child abuse scandals involving priests worldwide in recent times puts Casey’s fall into a different context altogether to that which applied in Ireland back at his resignation in 1992. But still the penance goes on. As a journalist in Galway in Casey’s heyday, I came to know him quite well and to like and enjoy his charisma. I was in Kerry when his Galway appointment was announced and, for the only time in my life, saw tears in the eyes of many of the priests of the diocese he was leaving. He was truly charismatic. He confirmed my children in Barna when their time came, and they have always been proud of that. To this day he is held in very high regard by the overwhelming majority of the plain people of the West whose hierarchy still continue his penance. Old hack’s prayers, being scarce, are as powerful sometimes as those of cardinals. I am going to say one for Eamon Casey tonight before I go to bed, and maybe some of you could rise to one too for a good, once great, old man.